Many of the Lake View rooms are located in the original hotel building which was built in 1820 and therefore delightful period features such as high ceilings and balconies add to our guests’ enjoyment of the space. These rooms also ensure that relaxation is paramount during a stay at The Lake Hotel. 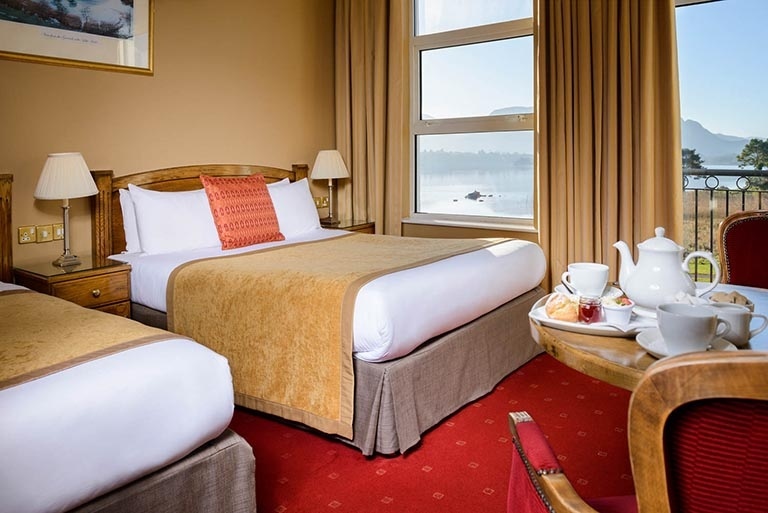 All Lake view rooms overlook the stunning vista of Killarney’s Lower Lake and National Park, a truly breathtaking sight to greet you each morning and evening. As the hotel has had several extensions added over the decades, the rooms within this category type can vary in size, layout and bed configuration. A selection of the Lake View rooms have twin beds, double beds or four poster beds and others have a balcony thus offering the opportunity to absorb the tranquility of this unique setting. If you wish to request a room with any particular features or layout, please mention this when making your reservation.